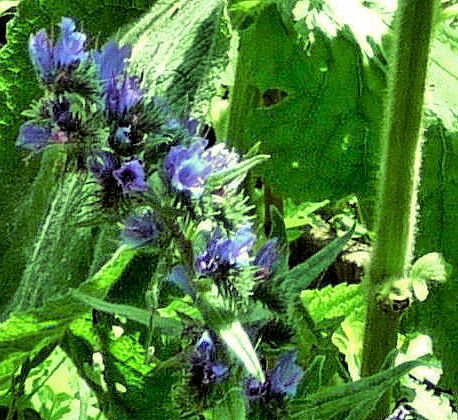 Echium vulgare’s spires of VIVID BLUE flowers rise from a clump of lanceolate leaves at its base. This wildflower can reach 30 inches in height, & bloom from late spring to early fall. It is drought tolerant and disease free. It likes dry, gritty soil & does well in gravel gardens. 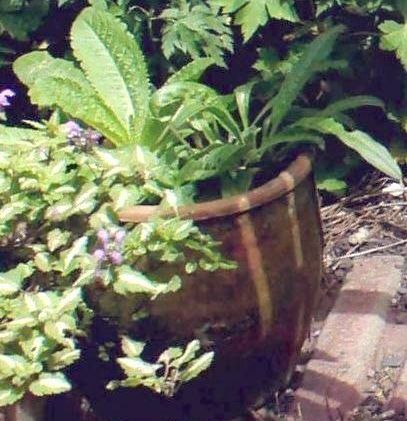 We had one, planted here in a large terracotta pot with a Teasel and a Wild Clary. When the teasel had crowded out the other two, Viper’s Bugloss was planted into the ground. Nectar-rich for honeybees & other pollinating insects, Viper’s bugloss proved a Bees’ Favourite. We hope to grow it here again & provide it with a grittier soil. The Art of Simpling, William Coles (1626-1662) An introduction to the Knowledge and Gathering of Plants. London: printed by J.G. for Nath:Brook, 1656. /A Modern Herbal, Maude Grieve, 1931. 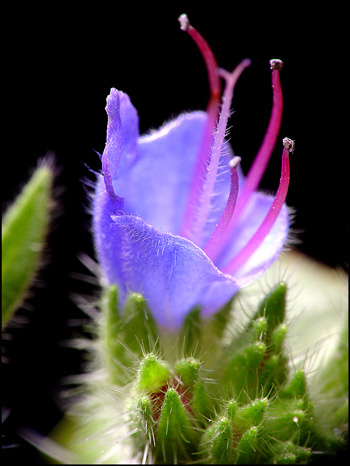 As for how it got its name, a website called www.honeytraveler.com, which looks at honey worldwide, has photos of Viper’s Bugloss seeds showing how the seed resembles a viper’s head. Echium is a Latin word taken from the Greek ‘echis’ for viper; ‘bugloss’ is Greek for ox tongue, referring to the roughness and shape of the plant’s leaves. Other names: Adderwort, Blue Bottle, Blue Cat’s Tail, Blue Devil, Blue Thistle, Blueweed, Bugloss, Cat’s Tail, Ironweed, North American Blueweed, Our Saviour’s Flannel, Snake Flower, Viper’s Grass, Viper’s Herb.